It’s always awesome when an Oakley package arrives on the doorstep, and this time the package contained a pair of vented Glacier Racing Jackets w/ Polarized Black Iridium lenses (and a spare pair of VR28s). 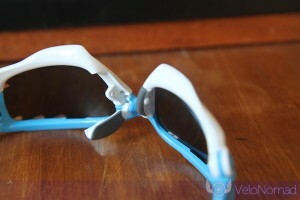 The Racing Jacket is a replacement for the Jawbone but looks very similar. 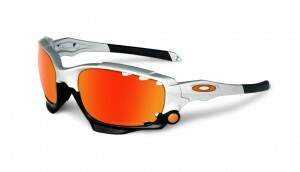 The Racing Jacket includes a retainer strap (removable) and swappable Oakley icons. Having ridden a lot in Radar Paths and M Frames I was looking forward to trying the Racing Jacket particularly on the bumpy roads of the Byron Bay hinterland in winter. This allows a thorough test of the nose piece (to make sure it doesn’t slip) and the protection from the cold wind in the eyes on fast descents. It’s fair to say Racing Jackets evoke polarised opinions. I personally love the look of the Racing Jackets. 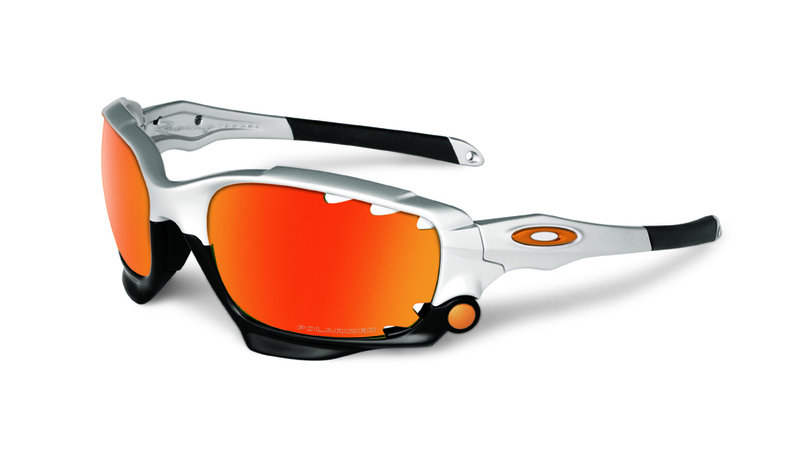 The Oakley Racing Jackets contain Oakley’s Switchlock feature, providing for rapid swapping of lenses. As I mentioned in my Radarlock review, Oakley states that this also helps protect the lenses from bending and warping that occur when you try and bend and snap lenses into place (like in the M Frames). Across many years use, this helps maintain the optical quality for the life of the glasses. The Switchlock system is much simpler and robust on the Racing Jackets than the Radarlocks. Simply release the clips on the nose and the bottom part of the frame swings open. Easy. The only thing to be wary of are the clip hinges on the nose assembly. Obviously on this scale you can’t expect high strength, near-indestructible hinges, so just be gentle when swinging them open. As I mentioned in the Oakley Radarlock review, if there’s one thing you can say about Oakley – their glasses are ridiculously high quality. Both the optical and construction quality put nearly all other brands to shame. I’ve never broken a pair through normal use and I’ve owned 6 different pairs in 17 years. Obviously the introduction of 4 hinge points means more points of failure, if you treat them appropriately, the hinges should be fine. And if they do break, you’ll no doubt be looked after by Oakley’s stupidly good warranty (read about my awesome experience with Oakley’s warranty). 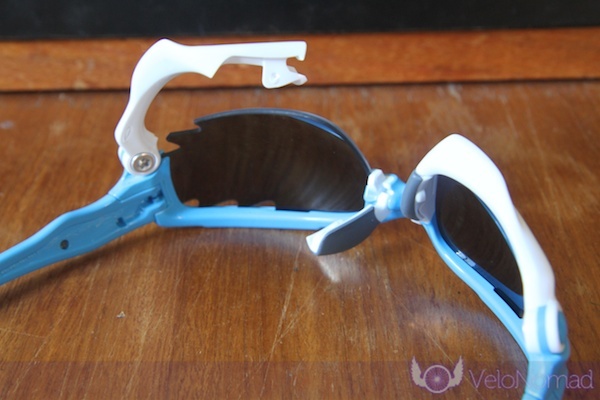 I didn’t try the removable retainer strap and honestly see no need for it, at least for use when cycling. It would be useful if wearing Racing Jackets whilst skiing or running perhaps. The retainer strap simply slips onto the end of the ear pieces. I’m really pleased with the nose piece/assembly. There are two rubber-like inserts that serve to prevent slippage down the nose, but also – usefully – aid in gripping the two Switchlock release clips. There are no rubber nose bombs like on Radars, M Frames and others, making the nose assembly more robust and long-lasting (and no lost parts). No problems here. I wear a Medium helmet. Obviously with a thick bottom lens frame, your vision is framed 360 degrees by a fully enclosed lens frame (as opposed to Radars or M Frames). This framing serves to create slightly more tunnel vision or focus. I find the bottom (bottom right for right eye, and bottom left for left eye) peripheral view is obstructed when quickly flicking a look over your shoulder. Obviously this is potentially problematic in races but for casual rides isn’t such an issue. The amount of head turn you use on these needs to be less or way more than Radars in order to get an unobstructed view. Over time, as you become accustomed to this, it should be second nature. I live on the far north coast of NSW near Byron Bay with lots of sun glare, so these particular lenses are great, even in winter. For lower light conditions, the spare VR28s suit nicely. An all important thing I like to check is “do these fit in the helmet vents?”. These fit (upside down of course) in the vents on a Specialized SWorks 2D. There’s a 2km hill near my place (average 10%) that’s perfect for testing whether sunglasses prevent high-speed (80km/h+), wind-induced, watery eyes. This is important because if you’re heading over to Europe to the big mountains, you want sunnies that prevent watery eyes on the fast (fast!) descents (Ventoux, 90km/h). These are probably the most effective Oakley’s I’ve worn in terms of reducing watery eyes. I tested these into a drizzly cold block head wind straight off the Pacific Ocean. No tears in the eyes. I rode these on a warm, humid climb with no apparent fogging. I’d have to test them fully on a humid summer day whilst doing lots of climbing in the lush Byron Bay hinterland, but I suspect they’ll be fine. 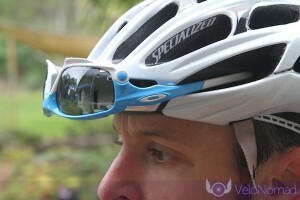 I love vented lenses as they suit the weather where I live – humid in summer. 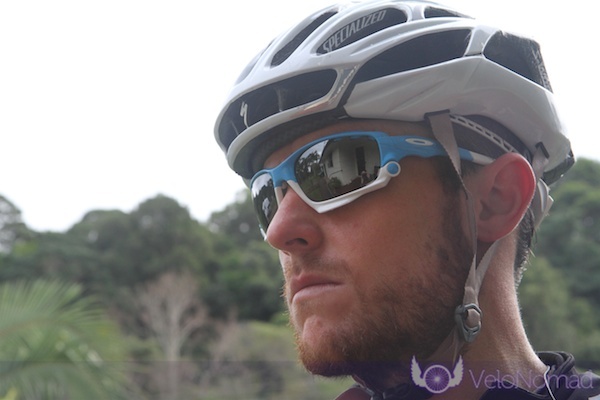 They’re also great for city dwellers – no foggy lenses at traffic light or coffee stops in winter! I reckon these are great value. They can be had for around AUD$200, and cheaper if you look around. Spare lens (VR28 in this case), Oakley Vault hard case, removable racing strap, great warranty and hands down best cycling sunnies going around = great value. As with all Oakleys, if treated well, they should last a long time, amortising the cost over many years. These are the best cycling sunglasses I’ve ever worn (in other words, these are the balls). As I’ve pointed out before, Oakley do themselves no favours in having such high standards of excellence – we come to expect excellence with every product. The Racing Jackets are light, fit well, don’t slip down the nose, have awesome optics and are just boss (I felt like Bernie Eisel when smashing through the local rolling hills at 45km/h). They’re awesome for windy conditions and the hills and the vented versions are especially awesome for warm, humid conditions (like where I live). There are a lot of hills where I live, so summer riding can lead to foggy sunnies. No issues in this regard. Whilst these might be an acquired taste to you aesthetically, I reckon you’ll be really happy with these – they’re just awesome. You can buy Oakley Racing Jackets from Oakley direct (crazy customisation available), at your local bike shop or local dealer. Tim, what’s your opinion on the Racing Jacket’s vs. Radarlock? I have these two models on my shortlist. I’m a mountain biker primarily, but do my share of k’s on the road bike as well. Hey Darcycle! I’d go Racing Jackets and here’s why. They have more eye coverage around the eye. They also come down closer to the skin. This is good for MTB when it’s wet. I remember doing the Otway Odyssey in atrocious conditions in M Frames. Mud kept flicking into my eyes for the entire 100km. Booooo! So for MTB, RJs will be better for preventing mud and dirt getting in your eyes. There is a new Oakley model, the Radarlock XL (which I am releasing a review on soon) which is also very good for eye coverage. Thanks Tim, bought some RJ’s yesterday and raced in them today in very dusty conditions. Even with contact lenses in I didn’t experience any eye irritation and the clarity really is superb. Thanks for the reviews, most helpful. …if you worry about that kind of thing! 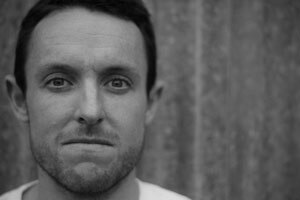 Tim, what’s your opinion on the Racing Jacket’s vs Radar EV vs Jawbreaker? I have these three models on my shortlist. I’m a weekend road cyclist. I just ware ordinary glasses. My eyes become watery from 50km/h. (Both Radar EV and Racing jacket suit well to my face. It’s obvious that Radar EV provide wider vision. Hi Kang – thanks for the question, I’ll put this in a video. I haven’t tried the EVs yet but am about to get some EV Uranium (Path or Pitch, PRIZM) to test. However they’re fairly similar to M2 Frames, which I have tried. Of that list I’d prefer EVs, but it depends on what you’re looking for. Jawbreakers are good at preventing watery eyes, as are the RJs. They’re both not as good as the Radarlock XL. They both don’t clear the air away as well as EVs but are still ok (this helps avoid fogging). Racing Jacket and Jawbreakers impede peripheral vision due to the frame wrap, so if that’s important to you, consider that. And as you need prescription lenses, it sounds as though RJ is your best option?